"Nothing is more expensive than a missed opportunity." H. Jackson Brown, Jr. I grew up near New York City. That means I was surrounded by Italian food. Italian-American food to be precise. In addition to the many restaurants, there were fantastic Italian delis with sausages hanging from the ceiling, cases full of fresh salads, prepared meals for reheating, cured meats, and amazing, fresh sandwiches. In New York, the long rolls stuffed with all kinds of things from meatballs to fried eggplant are called "heroes." And they are that to me. 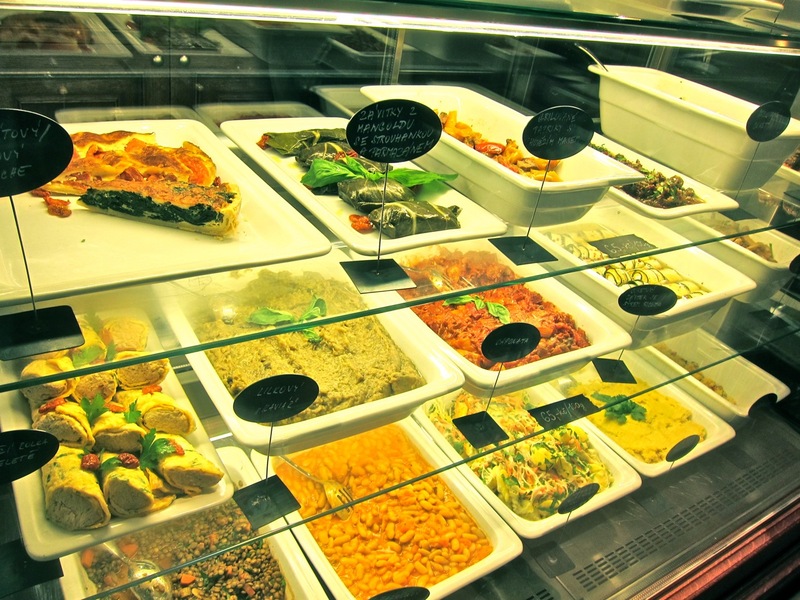 In recent years, Prague has been getting some high quality Italian food shops that remind me of my youth. 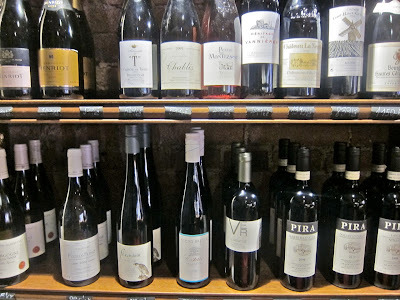 Wine Food Market and La Bottega di Aromi arrived in recent years. 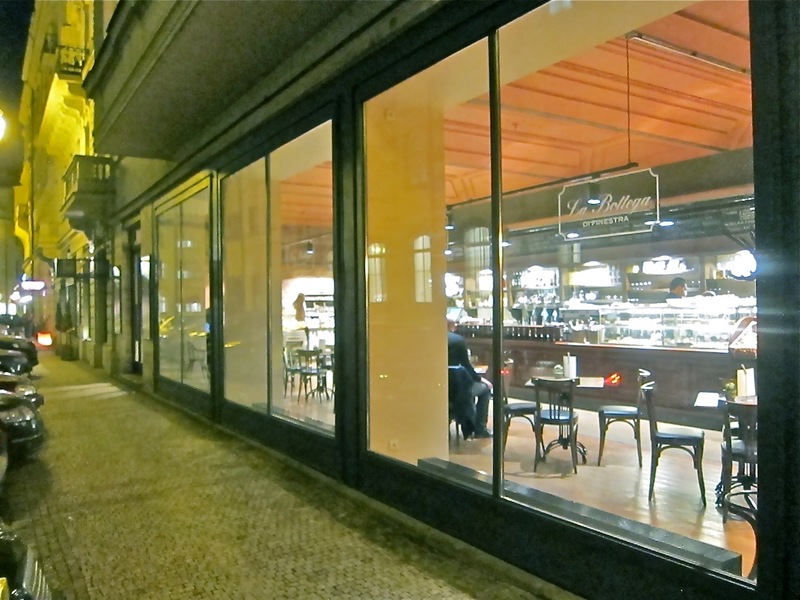 But the newest of all is La Bottega di Finestra. 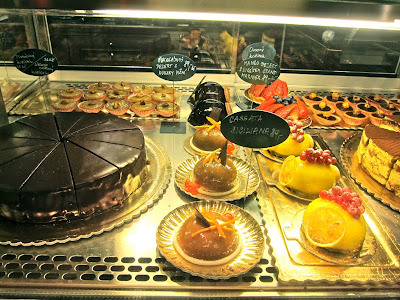 It's in Old Town, next to the restaurant La Finestra in Cucina, the sister restaurant of Aromi. When I walked in the door, it reminded me of a richer, fancier version of my childhood deli playgrounds. And I came to play. The shop's display cases are a cornucopia of Mediterranean edibles. Let's go through them on a case by case basis. 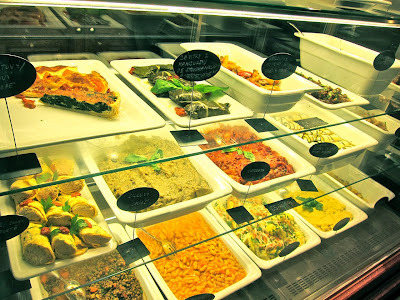 In the front room, along with a number of tables for sitting down for a nice meal, there are salads, quiches, beans, rolled and stuffed veggies and more. 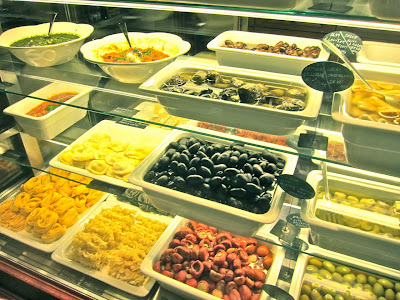 They have fresh pastas, sauces, and olives. 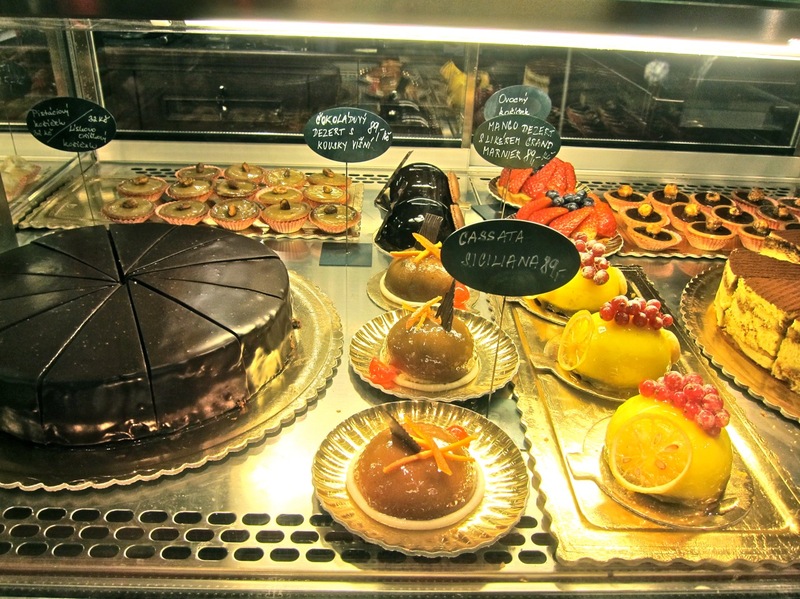 There's a dessert case with mostly Italian sweets and baked goods. 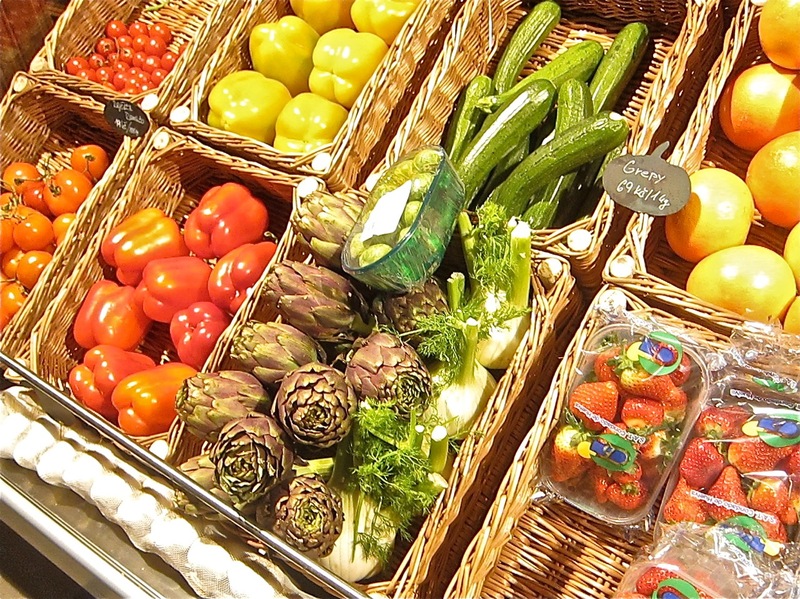 Wicker baskets offer up bright, fresh produce. 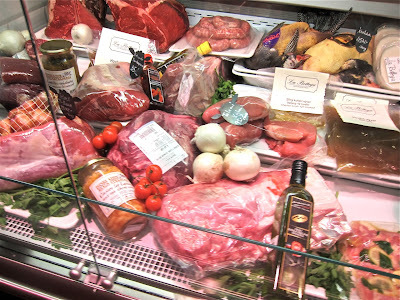 In the passage to the large back room, there's a meat case with fresh sausage, duck and other birds of a feather, and Chianina beef. 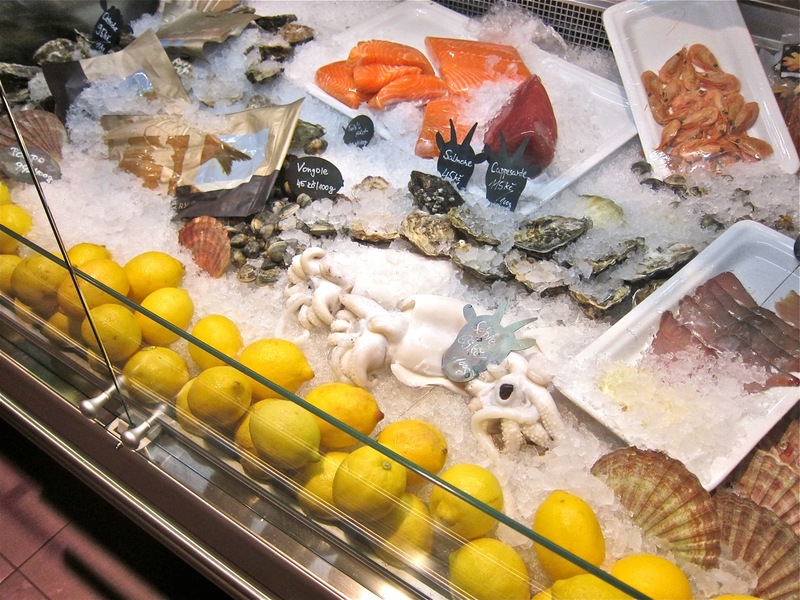 Close by are fresh fish and seafood on ice, including squid, oysters, salmon, and prawns. You can take the stuff home, or they'll cook it for you. 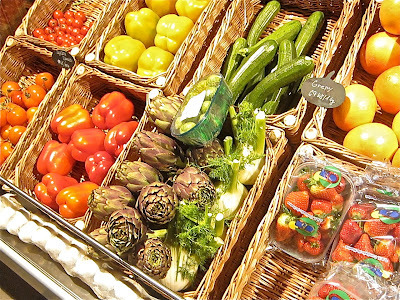 The caveats here are price is marked up 80 percent for preparation and it could take up to 45 minutes. In the back, walls were filled with medium to high-priced Italian wines -- many are 400 CZK and beyond. 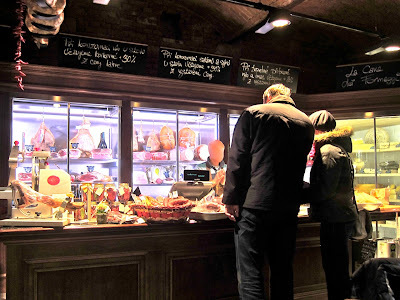 Nearby, there was an quick-moving Italian man to meet our ham and cheese needs.He works in front of a well-stocked "cheese cave." There are also tables in the back and we grabbed one. On the table was a menu with six daily special offerings. 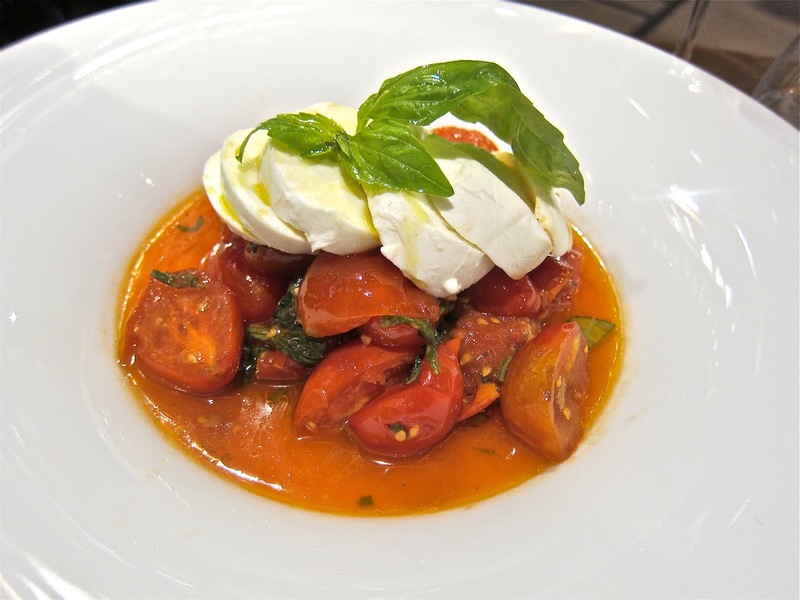 We started with the mozzarella and Piennolo tomatoes, which are only grown on vines around Mount Vesuvius (115 CZK). The cheese had a rich and creamy character, and there was plenty of basil. I'd never had this type of tomato. These were quite sour. But I thought it was a nice price for a Caprese with imported components. With our meal, we had .15 liter glasses of Hartmanm Pinot Grigio (110 CZK) La Minaia Gavi di Gavi (115 CZK). Both were dry and very drinkable, but we preferred the fruitier Pinot. Any bottle can be pulled off a shelf and served for the list price plus a 30 percent corkage fee. We also had a .7 liter bottle of Mattoni (75 CZK). 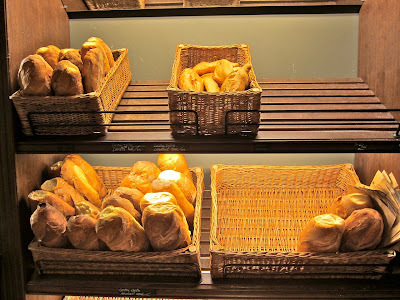 He had some of their excellent, crusty, homemade Italian bread and rolls (19 CZK). If you like them, you can by whole loaves. We tried some items from the salad case. I got the mangold leaf stuffed with bread crumbs and Parmesan. Mangold is also known as Swiss Chard. 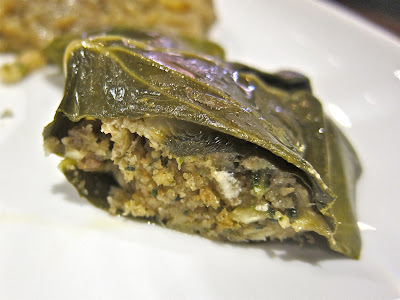 The full leaf had a refreshingly verdant flavor, though the cold block of crumbs and cheese inside were not especially interesting or the greatest texture. We tasted a beautifully smoky and silky aubergine caviar. It was one of the best eggplant spreads I've had. And there was a cold layered mozzarella, eggplant, and tomato offering. This was OK, but nothing too special. Maybe it'd be better if it wasn't served at such a cold temperature. 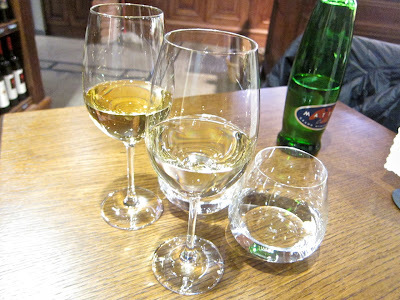 These three items on one plate came to 169 CZK. Then we wanted some hot stuff. 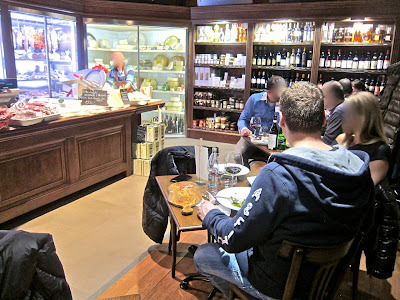 They had homemade veal and truffle ravioli behind the counter (145 CZK). The waitress suggested a butter and sage sauce. My Italian companion argued against it, saying the sage would clash with the truffle. I love butter and sage, but she was right. The butter was fine, but I had to take away some of the sage. Oh, and the ravioli was terrific, al dente pockets filled with minced meat and the aroma of the expensive mushrooms. 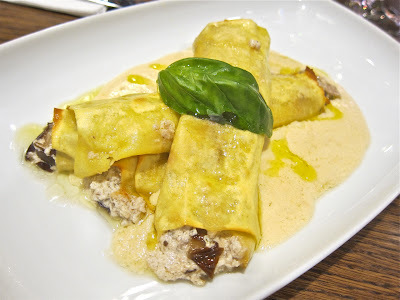 From the daily menu, I went for the cannelloni filled with ricotta, radicchio and topped with a Parmesan fondue (145 CZK). I thought it would be heavy. It wasn't (at least by my standards). 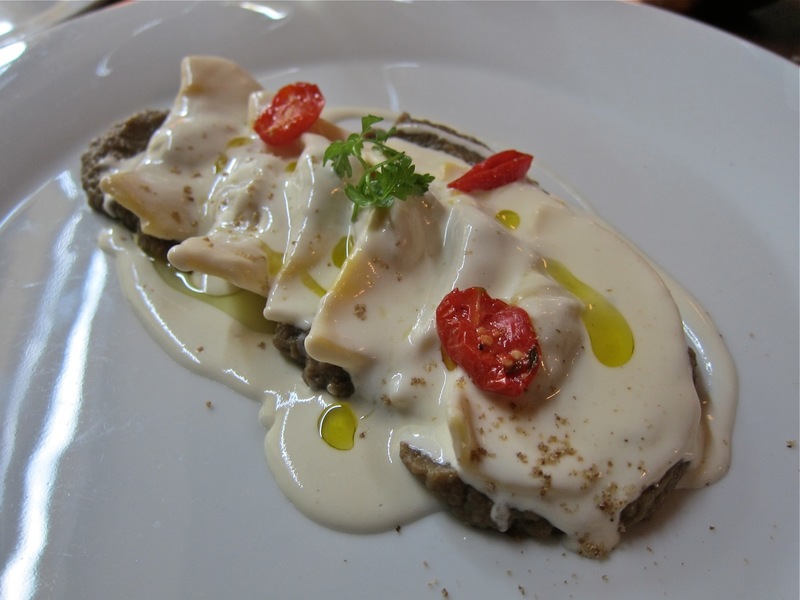 The interior was creamy and crunchy, while the Parmesan that pooled below but was not poured over the top, was tasty and tangy. Given the quality, it was a real good deal. We pressed on. We put ourselves in the hands of the master behind the counter. We asked him to pick out some cheeses. 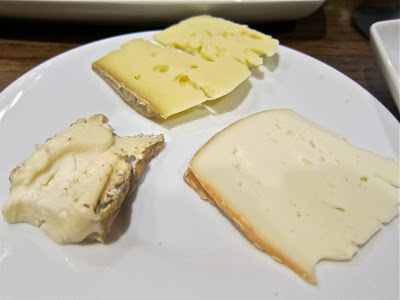 There was a salty, creamy Taleggio, a tangy Branzi from the Bergamo region, and a good and a goaty mountain goat cheese (capra alpina). We enjoyed that one the most. How much did the cheeses cost? I don't know. These weren't on the bill at the end. 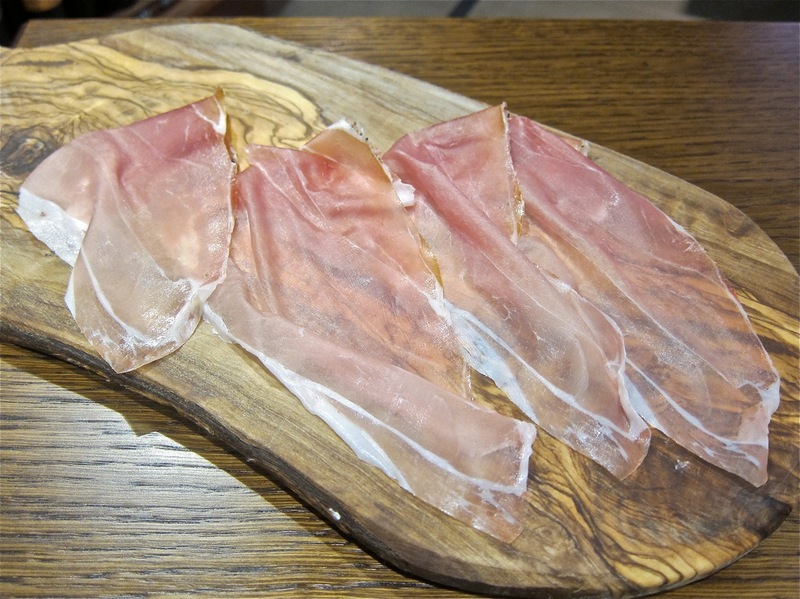 He also sliced us some Prosciutto di Parma that was so thin, you could see through it. It was quality stuff. But it was good it didn't weigh much. 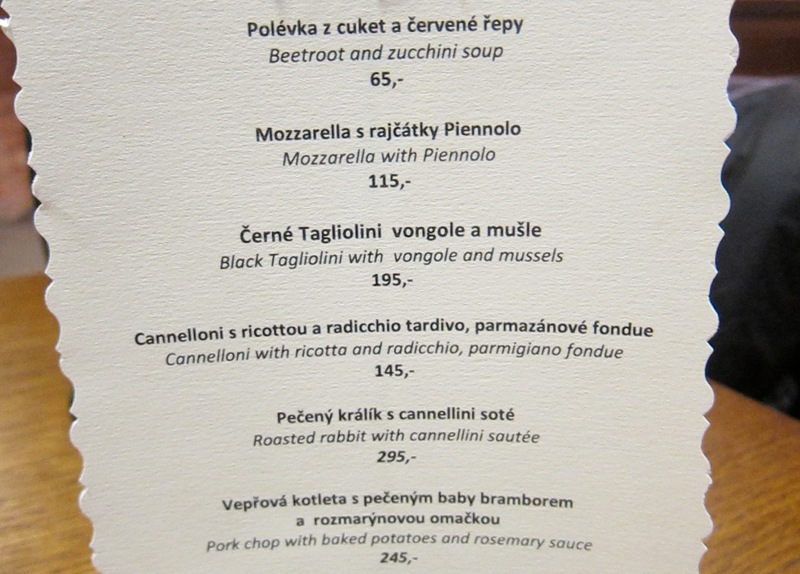 That ham goes for 1365 CZK a kilo. Our slices cost just 19 CZK. I was getting full, but I went full tilt at the desserts. I had a piccolo Cannolo Siciliano (35 CZK). 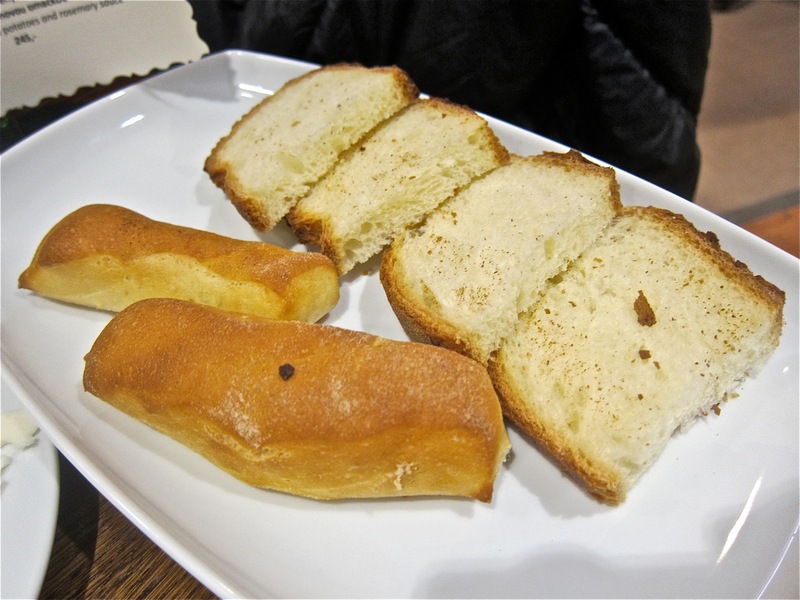 Inside the softened shell casing, the sweetened ricotta was lusciously lemony, with chunks of chocolate mixed in. 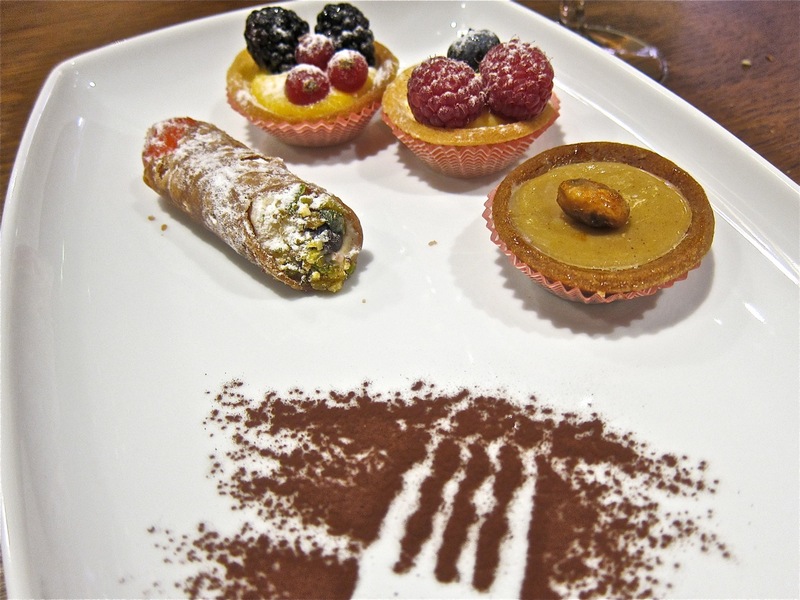 One tiny tart was filled with a rich pistachio puree (35 CZK). The other two had cream and fruit (32 CZK each). I liked them all but wasn't thrilled with the size to price ratio. This almost endless feast set me back 1162 CZK. I thought it was absolutely worth it. 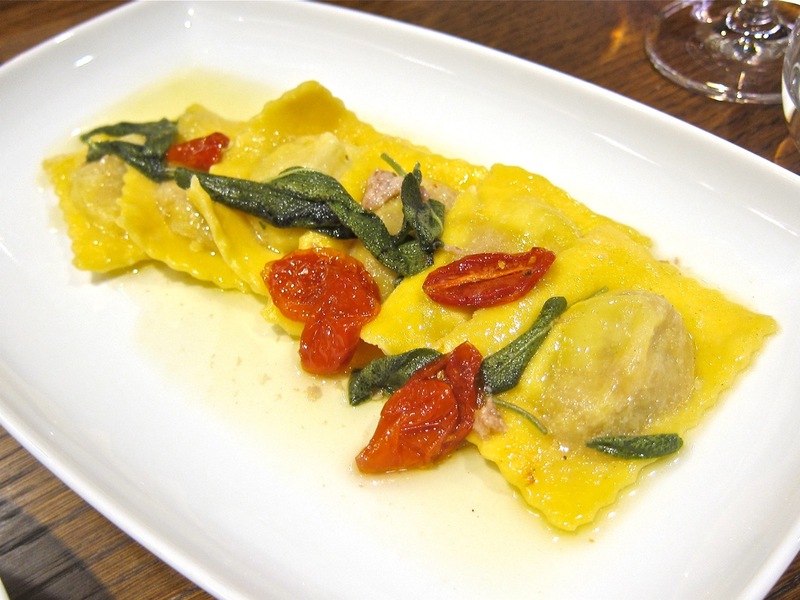 Before I go, I just have to mention that next door at La Finestra in Cucina, I had one of the best dishes of the year. 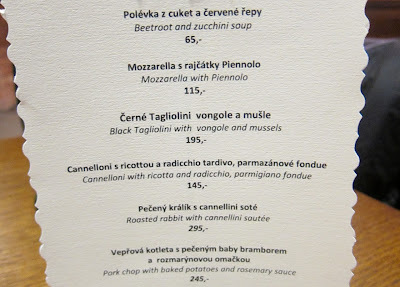 It was Ravioli filled with oxtail, served with aubergine caviar and Parmesan fondue (375 CZK). This ravioli released a beefy perfume that went up through the palate and directly into my sub-cranial pleasure centers. Eyes rolled back and the smile turned up. I saw this repeated when my vision returned to normal and my date took a bite. The blissful reaction was the same. The super smooth sauce was different than the version at La Bottega and was one of the most decadent things I've tasted in a while. 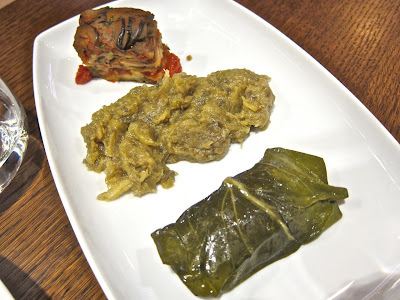 And the sweet eggplant puree underneath balanced it all out. Wow. Let me conclude by saying that of all the Italian shops that have rolled into town, La Bottega di Finestra is the Ferrari. Depending on your tastes and hunger, it can get a little expensive, but I'm glad I didn't miss the opportunity for a test drive.